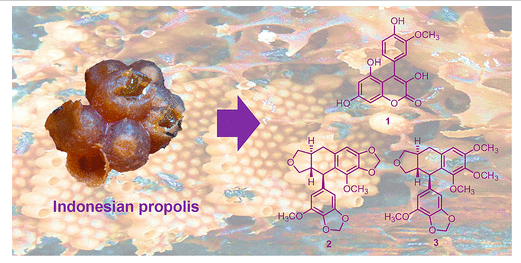 Three new compounds, namely, 4-(4′-hydroxy-3′-methoxyphenyl)-3,5,7-trihydroxycoumarin (1) and sulawesins A (2) and B (3), were isolated from the propolis of stingless bees (Tetragonula aff. biroi) collected on South Sulawesi, Indonesia. In addition, five known compounds, glyasperin A, broussoflavonol F, (2S)-5,7-dihydroxy-4′-methoxy-8-prenylflavanone, (1′S)-2-trans,4-trans-abscisic acid, and (1′S)-2-cis,4-trans-abscisic acid, were identified. The structures of the new compounds were determined by a combination of methods that included mass spectrometry and NMR spectroscopy. The absolute configuration of sulawesin A (2), a new podophyllotoxin derivative, was determined by X-ray crystallography. The absolute configuration of sulawesin B (3) was also determined by the ECD calculation. 4-(4′-Hydroxy-3′-methoxyphenyl)-3,5,7-trihydroxycoumarin (1) and sulawesin A (2) were examined for xanthine oxidase (XO) inhibitory activity; 1 exhibited XO inhibitory activity, with an IC50 value of 3.9 μM.